Why not class it up a notch with this cool pipe lighter from Colibri? 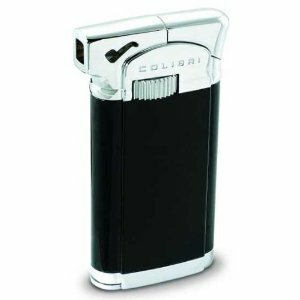 This right here is the Colibri Connaught Ii Lighter in Black and Polished Silver with Electro-Quartz ignition. Yeah, you heard me: ELECTRO QUARTZ!!! I don’t know what that is either, but I can tell you it means that it doesn’t require batteries, wick, or flint. You also get a 45 angled soft or “traditional” flame, built-in pipe tamper, fuel-level viewing window, and easy-access oversized flame adjuster.